I've been at gloProfessional for just over a month now. Since my arrival, I have been learning, learning, learning all about our wonderful products-- and there is a lot to learn! During product training I wrote notes in the margins that read like this: "Get this for winter!" or "Gen (my sister) would LOVE this," and "Xmas present idea for Mom!" Yesterday I made my first gloProfessional product order. When it came right down to it, there wasn't a gift in the bunch-- instead, I checked off just about every product in the gloClear line to help my North Carolina humidity-loving skin adjust to the climate here in Denver. Today I can report that I am smitten. I've never used acne products that so beautifully balanced the needs of my skin. Nothing left me with that post-acne-treatment stiffness that so many washes and treatments I've tried before have done. My roommate (also from North Carolina) feels the same way. Here's a text message she sent me from work this morning: "Washing my face was my motivation to get out of bed this morning. It just makes me happy." That makes two of us! 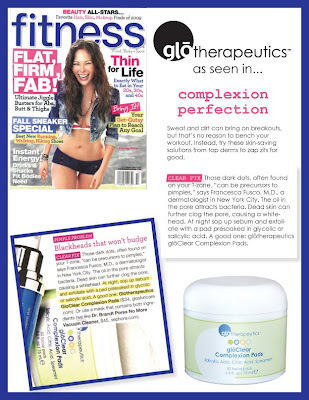 And more if you count the editors at Fitness magazine who featured the gloClear Complexion Pads (see above) in the October issue. It's hard not to be a fan of such a wonderful product line!